Ever since his days at Rutgers University playing defensive tackle, Eric LeGrand showed amazing promise on the football field. However, it was unfortunately his unyielding attitude and dedication to defending his teammates that led to a horrible accident in 2010 in a game against the Army Black Nights. A spinal cord injury ended LeGrand’s professional football career, but it didn’t break his spirit or lessen his passion for the sport and for life as a whole. Recovery was a long and difficult road. As Eric LeGrand learned how to breathe on his own again and regained use of his arms, he decided to go public with the healing process. Since then, he has stayed in the football arena as a symbolic member of the Tampa Bay Buccaneers in 2012, a promoter for Subway with other athletes, and the star of online miniseries Mission Possible, a documentary that speaks with people who have overcome unimaginable difficulties in their liftetimes. 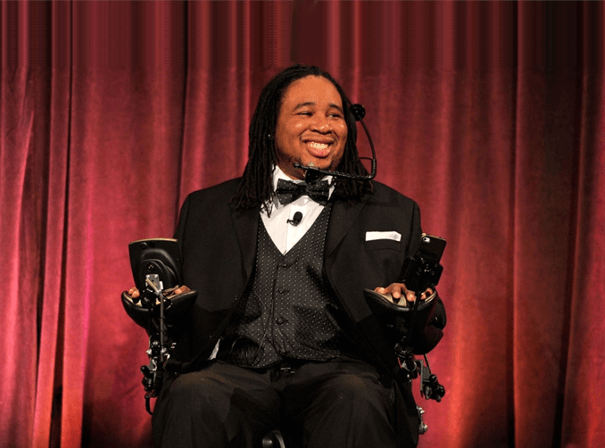 Eric LeGrand used his own injury as the launching point of an inspirational speaking career. He is heavily involved with both the Christopher Reeve Foundation, and a A Walk to Believe 5K -an event in which participants run, walk, or wheelchair to raise money for research aimed at helping those affected by paralysis. While he tours all around the United States bringing messages of self-belief and inspiration to high schools and other groups, he continues to focus his energy on the development of new technologies to help people with similar injuries get out of their wheelchairs and regain more control over their lives.